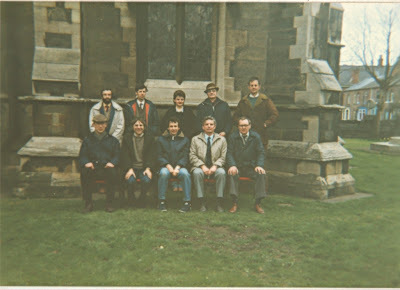 The 10th Annual W. W. Worthington Trophy Ten-Bell Striking Competition was held at St. Pauls, Burton on 11th April. The weather this year was better than it has been many times in the past, in that it did not rain, but a wind of virtually hurricane proportions kept most of those present indoors whilst estimating the relative merits of the competing bands. The vicar of Burton, Reverend Morris, made the draw at 2.00 p.m. but this occasioned some consternation since only six pieces of paper proved to be in the pot for seven competing teams! After some consultation and after providing the missing team with at least some chance of ringing first, fate took its hand, because in the second draw the missing team were drawn last. The test piece was a touch of 315 Stedman Caters, which all the bands negotiated safely. The format of the competition is that each band has a total of half an hour to practise and complete their test piece, the start of which they signal to the judges with two whole pulls of rounds on the front six. Bands can ring anything they like for practice, but run the risk of disqualification if their test piece over runs the total time allowed. Whilst competition ringing was taking place three towers were open for general ringing, Lullington (6), Overseale (8) and Netherseale (8). All proved popular but especially Lulling­ton, as it is a tower rarely available. The ringing chamber here has recently been completely redecorated and carpeted by some people from NACRO – a source of labour for church projects that might perhaps be more widely used. Refreshments for exhausted ringers were provided by the ladies of St. Paul’s during the afternoon and were most welcome. Our judge Nigel Herriott, who was assisted by Geoffrey Randall, kept us all on tenterhooks for over half an hour before emerging with the results. He prefaced these with some general remarks, saying that whilst he felt he had heard no outstandingly good ringing, he was aware that the bells were not the easiest on which to achieve good striking. 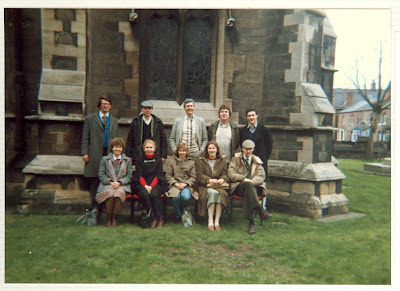 He had however enjoyed very much listening to the ringing and the faults for each band were: 1st – St. Martin’s Guild (69); 2nd – Worcestershire and Districts Association (88); 3rd – Midland Counties Guild (112); 4th – Lichfield Archdeaconry Society (124); 5th – North Staffordshire Association (127); 6th – Derby Diocesan Association (133); 7th – Leicester Diocesan Guild (Syston District) (180). After thanking the judge, Reverend Morris presented the trophy to Frances Dodds, the Captain of the St. Martin’s Guild team. 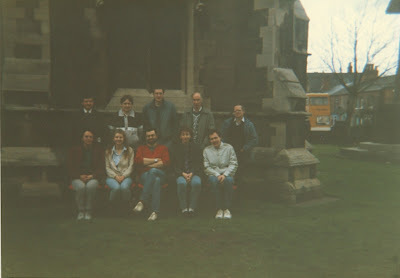 He offered the St. Martin’s ringers a peal at St. Paul’s and also offered a date for next year’s competition – Saturday 26th March 1988. He ended by saying how much he and he was sure, most of his colleagues, appreciated the efforts of all those ringers who rang regularly Sunday by Sunday in their home churches. 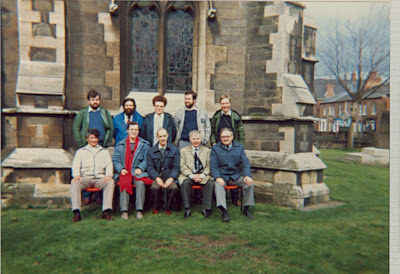 Martin D Fellows, Martin G Powell, David Beacham, Michael G Clements, Alan E Hartley, Colin E Andrews, David G Franklin, Richard J Clements, Andrew D Evans, Stuart D Piper. 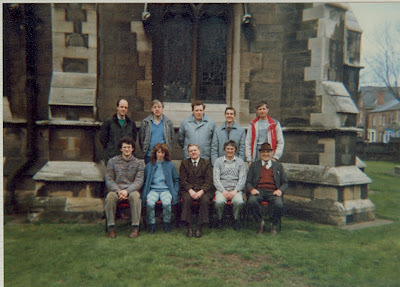 Stuart C W Hutchieson, Peter D Sell, Mike Claridge, Marlene Townsend, Rachel J Everett, Mark Wood, David C Everett, Philip R Johnson, Bernard J Townsend, David M Webb. 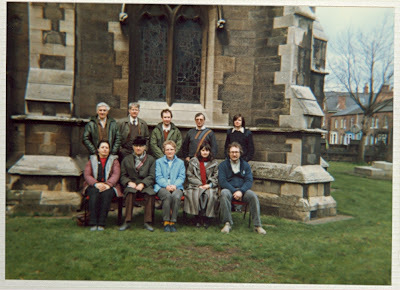 C Frederick C Pearson, Jane E Orchard, Patricia A M Halls, Gordon A Halls, Margaret A Wright, John V Chadwick, Steven D Chandler, F Gordon Faulks, David J Marshall, Alan Rowe. 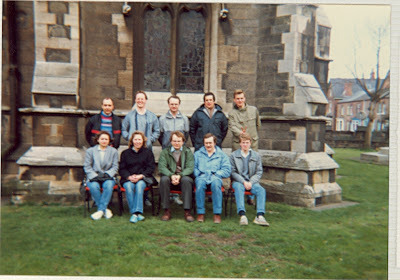 Sean D Smith, Sarah M Pawley, Howell J Williams, Vikki Stevenson, Gillian Loveridge, Roland H Cook, Christopher H Robbins, Jonathan R Pawley, J Julian Pawley, Eric S Loveridge.